Which may explain why I have been having so much fun reading Between Man and Beast, by Monte Reel. 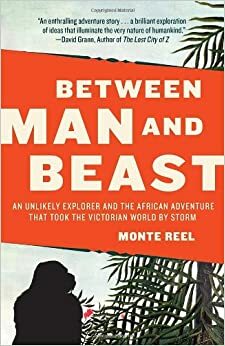 It is the true story of Paul Du Chaillu, an African-born Frenchman who, in the mid-nineteenth century became the first non-African to see (and shoot) gorillas. But the reason I am telling you all this is to bring up another person who appears tangentially in the story, a man I have never heard of. Charles Mudie was one of the most influential people in 19th-century British literature and one who, in odd-ways, feels like a person from the 21st. To use current buzzwords, he was an innovator who disrupted his industry through mass marketing. So, how did Mudie affect literature? He was not an author, an editor, a publisher, a reviewer, or even a bookseller. In fact, he more or less invented his own occupation (and that's very 21st century, isn't it?). 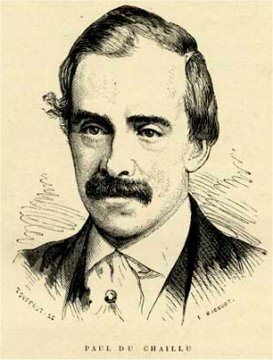 In the 1850s he founded Mudie's Lending Library. For an annual fee of a guinea (just over a pound) anyone could borrow as many books as they wanted - one at a time. By 1860 when Du Chaillu arrived in London with his gorillas, Mudie had shops in many major British cities. His main location held more than 800,000 volumes. If he thought a book was going to be popular he could order enough copies to double a publisher's print run. (And like many modern businesses he insisted on a punishing discount from his suppliers.) He put out lists of "Principal New and Choice Books," essentially the first bestseller list. Nowadays a lot of people worry about how Amazon can dictate terms to the publishing business. But Mudie was there first. Publishers knew that if he found a book objectionable it might not find its way to his shelf, and it definitely would not appear on his coveted list. The reason Victorian novels were published in three volumes? So that Mudie could satisfy three customers at once. His name is casually dropped in Oscar Wilde's The Importance of Being Earnest and Anthony Trollope's Can You Forgive Her? where he is described as "the great librarian." Funny, I always thought that was me. And now I want to get back to Monte Reel's book, which I did not borrow from any kind of library. Pleasant reading, all. Rob, Mudie makes me think of the saying "the more things change, the more they stay the same." And maybe Jeff Bezos had heard of Mudie... --- By the way, love the hat! Paul, maybe Bezos did. Janice, later in life Du Chaillu returned to Africa and declined to shoot anymore, preferring to study them alive. The other thing about Mudie's is that he was the Victorian equivalent of the Hays Commission: everything had to follow his moral code. Not everyone appreciated this, even among the nice people: In Anthony Trollope's "The Eustace Diamonds", old Lady Linlithgow tells her new companion, "I don't subscribe to Mudie's, because when I asked for 'Adam Bede,' they always sent me the 'Bandit Chief.' Perhaps you can borrow books from your friends at Richmond." Some authors (like Thomas Hardy and George Moore) found it hard to get into his circulation. Rob, your post brought back some memories. During my senior year in high school, after trying out for many plays and never making it, I got the coveted role of Townsperson in Inherit the Wind. (I think the director felt sorry for me. )I didn't have any lines, but I did get to sing and murmur a lot--in chorus with about twenty other townspeople, of course. It was great fun.